Exclusive to Face Beauty Company our signature facials embody the philosophy of creating bespoke procedures by combining advanced techniques and active products to achieve the best results possible. Starting with a skin consultation we individually develop a program that is tailored to each client’s needs using non invasive but very advanced skin treatments and cosmeceutical products to achieve healthy looking skin. CACI micro current which achieves instantly visible results on sagging muscles and skin, increases the production of collagen and tightens the contours of the face. Uses gentle pulse waves to deliver active vitamins deep into the dermis, helping pigmentation, wrinkles and sun damage. Environ DF machine which uses active forms of vitamins A & C and peptides delivered to the lower layers of skin using soundwaves and pulses. This improves the appearance of lines, sun-damage, problem skin, uneven skintone and dryness. Gentle peels which achieve fantastic results without damaging the skin. Stimulates growth factors within the skin. Also destroys bacteria, boosts hydration, removes the build up of dead skin cells on the surface of the skin and helps to tighten, decongest and smooth the skin. Radio Frequency skin tightening which selectively heats skin tissue and this in turn causes collagen fibres to contract producing new collagen – designed to provide tighter looking skin. Good for fine wrinkles and loose skin. High Frequency which helps kill bacteria and reduce inflammation, hence the acne-fighting benefits. This also increases circulation to stimulate collagen and reduce puffiness. In most cases these are also available as individual treatments where appropriate (more information below) and we can discuss this when we meet. 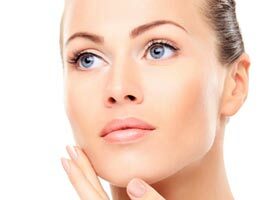 Our bespoke Anti Ageing Facials concentrate on your particular areas of concern and any potential problems. As such we always start with a free skin consultation. Once we have a clearer picture of what you want to achieve we can give you some options to suit. We typically start with a steam deep cleanse or a very gentle peel. These prepare the skin for the technologies and products we have selected for your specific treatment. To finish we use a calming algae mask, applied over serums containing vitamins and peptides, personalised for your skin. Clips are attached to the mask through which gentle sound waves will run through, enabling deep penetration of the serums. Once the mask has been removed a suitable face cream will be applied. CACI uses micro-current to lift, tone and re-educate the facial muscles. It tightens the contours of your face and increases the production of collagen, helping to smooth and tighten the skin. For the best results a course of 10-14 is required twice a week, then every four to six weeks as maintenance. Pay upfront for a course of ten treatments and one will be free. Pay upfront for a course of fourteen treatments and two will be free. Radio Frequency heats the skin to 39-40 degrees causing collagen stimulation. The heat initially causes damage to the collagen, while causing no damage to the upper layers and tightening of the skin occurs during the course of the skin’s self repair. It is an incredible skin tightening treatment. Developed here at Face Beauty, this involves a gentle peel to exfoliate the skin using gentle sound waves to increase the effectiveness of the cleanse. Finished with vitamin rich cosmeceutical serums applied underneath a calming mask that has gentle pulses running through it to enhance the penetration of the serums. Your skin will be beautifully clean as well as completely revived. Ideal for clients with sun damage and/or problem skins such as acne, rosacea while at the same time providing skin rejuvenation for all skin types. This innovative approach uses gentle levels of lactic acid which achieves measurable results while caring for the skin. Unlike the old peels, which stripped away the fragile layers of the epidermis, the Environ Cool peel helps achieve smoother, lighter, healthier skin. It also stimulates growth factors. Best result are achieved if done weekly for 4 weeks. Collagen Stimulation Therapy™ is a cutting-edge treatment technique that harnesses your body’s natural powers of healing to increase collagen and achieve incredible results. It is especially effective for addressing the visible signs of ageing, as well as sun damage, scarring, slackened skin, stretch marks, uneven skin tone and dilated blood vessels. Between three and six treatments are required. WHAT WILL HAPPEN DURING THE COLLAGEN STIMULATION THERAPY TREATMENT? During this revolutionary procedure, a skincare professional will apply a topical anaesthetic to ensure your comfort and will use a small instrument containing tiny needles (1mm – 3mm) to create thousands of microscopic channels in your skin. This causes a minimal amount of bleeding that stops within minutes. HOW DOES COLLAGEN STIMULATION THERAPY WORK? The body responds to collagen Stimulation Therapy™ in the same way as it would to an injury. The small amount of bleeding caused during treatment releases powerful growth factors, part of a natural healing response that results in increased collagen and elastin production. If you'd like to discuss your skin with us request a FREE Skin Consultation. I have known Liz for quite a few years now. I have nothing but extremely good things to say about her personally and her staff. Liz always takes great care in any treatments that she offers, be it a simple manicure or a long-term treatment – of which I’ve had both. As a client I must admit I love her new salon, it’s a very personal experience. When I moved back to the area eight years ago, a friend recommended Liz. Over the years I have seen her and Jodie regularly for waxing and mani-pedis. However, Liz’s real skill is in skin care. Not just regular “maintenance” facials, but a truly bespoke service reacting to fluctuations in my skin health due to stress and hormones. This included CACI and laser treatments and introducing me to the wonderful Environ system. Great treatments (Caci, Laser, waxing, massage, facials and nails to name a few) by two really knowledgeable and lovely therapists. Try their bespoke facials for a little bit of heaven that will leave you feeling relaxed and looking radiant. Great online shop as well.